To Sum It Up: In the world of the Seven Kingdoms, some children are born with extraordinary skills, called Graces. Katsa’s Grace happens to be killing, which her uncle, King Randa, exploits. He happily sends Katsa off to threaten/punish those who displease him. To most people, Katsa is Randa’s one-woman goon squad. Little does anyone suspect that she is behind the secret Council, which carries out covert missions to help hapless subjects throughout the kingdoms. It is during one of these missions that Katsa meets another Graceling, Prince Po of Lienid. Neither has any idea how entwined their paths are about to become. 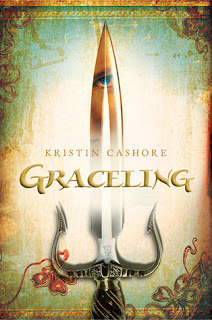 Review: Graceling seemed like two different books to me. The story gets off to a rollicking start, with Katsa leading a Council mission to rescue a kidnapping victim. In the first few pages, she displays her legendary combat skills as she knocks out a succession of guards. She also encounters Po for the first time, although she does not know his true identity. Katsa does realize that he’s Graced, apparently in fighting. With such an exciting opening, I was a bit disappointed when the plot wound down. I thought that the pacing lost momentum during Katsa and Po’s journey. Meanwhile, the grammar cop in me was going crazy reading consecutive sentences beginning with “and.” I know that it’s become common to start sentences with conjunctions, but I found them distracting at times. Fast forward to the second half of the book. The pacing is spot-on, and the prose flows much more smoothly. The various elements of the story (the mystery surrounding the kidnapping of Po’s grandfather, the truth behind Katsa and Po’s Graces, Katsa and Po’s relationship) clicked together; I think that before, they were competing with each other for the reader’s attention rather than forming parts of a whole. I really became invested in the book at this point and couldn’t put it down until I finished it. The idea of being Graced was unique and interesting. I also liked the cast of supporting characters. I hope that Raffin has a larger role in the rest of the series; it looks like Bitterblue is definitely getting one in the third book. I absolutely loved Po; he’s the perfect counterbalance to Katsa. As for Katsa herself, my opinion is mixed. I loved her strength, bravery, and determination. My gripe is with her treatment of Po. There is absolutely nothing wrong with not wanting to get married or have children. Katsa, however, takes this view to what I think is an extreme. She goes on at length about how she’ll never marry because it means belonging to another person. Po doesn’t want her to be his possession. I’m sorry, but when a guy literally lets you use him as punching bag, he’s earned some of your trust. I wish Katsa could see that. Overall, I found Graceling to be an enjoyable fantasy novel. The beginning has some ups and downs, but the second half more than makes up for them. All in All: This was a library borrow. Although I’ll definitely continue reading the series, I’m not sure that I would reread Graceling over and over again. I really liked this one - keep reading the series. The next book, Fire, has little in common with Graceling, which some people didn't like, but I didn't mind. I've heard about Fire being sort of a standalone book, but I'm definitely sticking with the series. I can't wait to read Bitterblue, either.